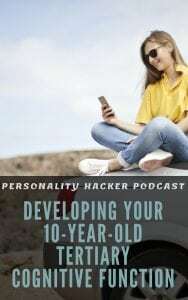 In this episode Joel and Antonia talk about developing a healthy relationship with your tertiary cognitive function (what we call the 10-year-old in the Car Model). 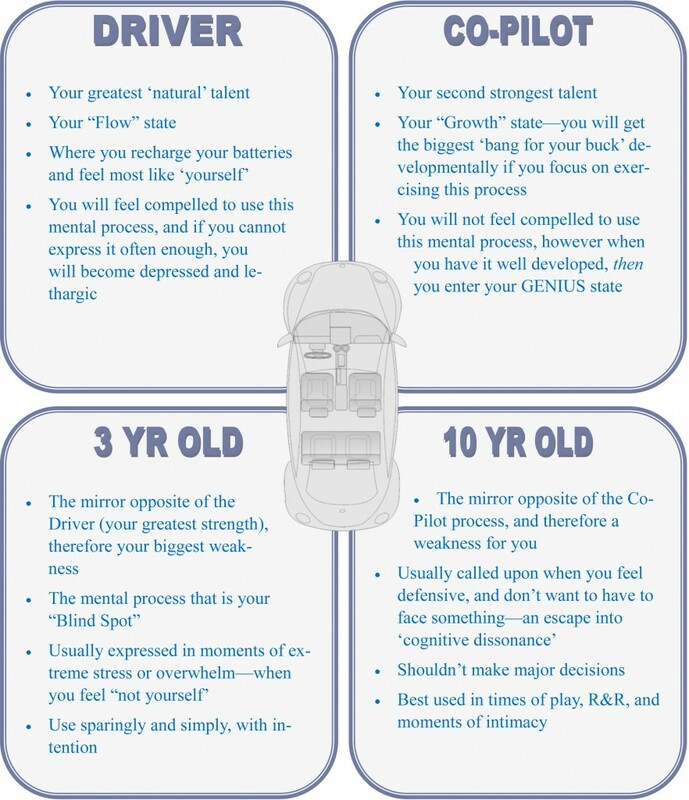 10 year old cognitive function is the one we go to in place of the copilot. Our chief suggestion for growth is to focus on the copilot. We encourage people to stop giving preference to their 10 year old in place of the copilot. This is not intended as a demonization of the 10 year old. Today we want to show you how accessing your 10 year old in a certain way can accelerate your personal growth. It is possible to accelerate this process with focused personal growth. If you spend enough time exercising your copilot you may be ready to start working on your 10 year old. What is the loop we are always discouraging people from exercising? The loop is the tendency to stay in the same attitude with which you lead. If you are an introvert you get caught in a loop that favors the introverted world. If you are an extravert you get caught in a loop that favors the extraverted world. How can we use our 10 year old to be a beneficial tool in our basket? When we get caught in the loop we are usually doing it because our dominant process is practicing confirmation bias. The 10 year old will usually support the viewpoint of the Driver, and sometimes this is exactly what our driver is looking for. When we have a good healthy relationship with our 10 year old we find it helps support us because it gives us extra tools that we wouldn’t necessarily have access to. INTJ – Imagine an INTJ in a relationship where things aren’t going too well. 10 yr old may say, “This relationship is doomed,” because that is what the Driver is already thinking. Suggestion: Get into copilot Te* and make pro/con list and create metric around it. What is the dynamic? How are you contributing to this dynamic? 10 year old is telling you that this is completely unfixable, but your copilot may indicate there is a way to save the relationship if you act like an adult and stop asking guidance from a 10 year old. Alternatively, Let’s say you are going to your copilot and using the lens of your best and highest self already. How will the 10 year old show up in this case? It is still there but it is no longer just a mindless support system. For INTJs, the 10 year old is Fi which helps them see how they feel and how others feel. As a support to the copilot, Fi will make and INTJ more sympathetic. It’s about implementing systems that make everyone feel good. Implementing strategies that take everyone into consideration. 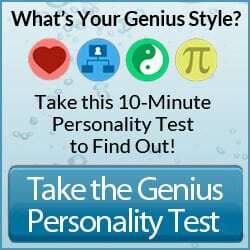 ENTP – 10 year old Fe – This manifests as disconcerting connections. Social anxiety resulting in emotional meltdown. Copilot helps ENTPs get rational without the emotional variable. ENTPs bring clarity by using their copilot Ti. The 10 year old helps them to communicate truths in a way that is more palatable. Delivering a truth that needs to be delivered in a package that doesn’t trigger its listeners. The 10 year old helps us flush out our messages and gets us in a space where we are more effective at what we are attempting to accomplish. ISTP – 10 year old Ni: Ti/Ni loop. ISTPs at their best in Se – copilot. 10 year old needs in the moment experience to be used well by ISTPs. An ISTP might speculate wrongly if he doesn’t start with Se and follow with Ni. Ni can support Se in anticipating what can happen in the moment. Great in law enforcement. ESFJ – 10 year old is Ne: in the Fe/Ne loop, ESFJs create patterns that aren’t accurate. Si would look at the precedent and past experience, then 10 year old could form a pattern based upon actual evidence rather than theoretical speculation. Ne becomes more accurate when used in conjunction with Si. How have you gone to your 10 year old in a defensive way? How has it supported your copilot in a good way? When have things gone right and when have things gone terribly wrong? Post your comments below. Is there any podcast on all the other tertiary functions and how they could potentially aid the person? Really wanting that. ENFP here! I’m hanging in my 10-year old (effectiveness zone) how do I GET OUT?! My 3 year old (memory) is like my driver! In the dark place here….. Joel? Feeling unhealthy enfp help? INFP here! As a teen (I’m in my twenties now) I struggled a lot to get out of my comfort zone. As a child (like literally ten) I hated change and held onto traditions (such as holidays and vacations) very tightly. I’ve grown out of a lot of that, but I’m still not crazy about change. At work we occasionally change procedures and start doing things a new way and I usually inwardly fume for a few days. I’m learning to tell myself that in a few months it will be as comfortable as the old way and to give it some time! Through my teens, the encouragement of my parents and the necessities of becoming an adult got me to (unknowingly!) start working on my Ne and I grew A LOT! I still have a long way to go to truly develop my Ne, but I have definitely already seen the benefits. My Si hasn’t always been my enemy, though. In high school (I was homeschooled) I had complete charge of my schedule and responsibility to get things done. I think my Si helped me stick to a schedule since it involved doing things that same way over and over. I’ve heard that sometimes INFPs can be really opposed to tradition, but for me it is a personal value, so I can have some fun with my Si to create meaningful traditions. INFJ here, and the way I think my Terciary cognitive function Ti works to my benefit is this: I’m working on a problem; I’m expressing it. Now I’m hearing data points pop into my mind. I listen to them and fine tune my expression to take in these data points, resulting in a better-reasoned, fact filled argument. The problem with this example is it doesn’t show me in stress mode. So here is another example of me in stress mode, using Ti to my benefit: I’ve been slighted by a lover; I go into defense mode; pride won’t let me apologize; I string him out for three days. Now I find something to say to him (Fe) that would end the power struggle between us, but I don’t use it. I’m listening further to a deeper message my body is saying to me. It’s telling me I’ve been feeling lost in the relationship recently. I’ve been giving too much of my time to him and not enough time to myself. So I resolve to spend more time on me and my goals, surrounding myself with things I love to do, projects I want to accomplish, rather than focus exclusively on him. So I apologize authentically to him, but delve into the delicious action of doing things that interest me. And it feels good. This latter situation is tricky, because Defence Mode (our Terciary 10 year old) is a Snake in the Grass. Am I really happier spending more time with myself than him? I decide yes, because I’m happy surrounded by things I love to do, and while I miss him, I no longer feel lost, and most importantly, I’m still feeling an aversion to checking for text messages from him. This could be because I’m hurt, disappointed, and vulnerable and that my perfectionism is still showing. But I think it’s important to pause and look in depth at why I’m still feeling this aversion to him. Obviously, there’s a lot of scar tissue around this issue for me. So it’s tricky. It’s hard to know when Ti is acting as a benefit or a Sabotage. I’m INFP and I tend to go to my 10 year old process (Memory) when something in my relationship goes wrong. I tend to think that I have not grown from a previous relationship, and I have a hunch/impending fear that the relationship will end in the same way the previous one did. I tried to use my co-pilot exploration process to respond and act in a different way, it did help me remember using my 10 year old Memory process what exactly happened or has been happening before the relationship went south. In terms of relationships I guess it might be wise to take small exploration steps instead of drastic ones to cut any loss/reduce impact. What do you think? AWESOME content! Thanks Joel & Antonia! on Facebook in case my friends wanted to see. Thanks! Hello Joel and Antonia! I’m curious if you could help me here. I’m an ENTJ and I have spent a large amount of time in both my driver and co-pilot process. And have come to make some important decisions based on my conclusions there. My question is what exactly does it mean to develop the tertiary process? What does that look like for somebody who has developed those? Does that mean at some point it would be safe for me to make important decisions based on how things feel for me physically or is that never a good idea? I skateboard a lot and I find that to be extremely enjoyable, i’m not amazing but i’m not bad either. I can see how with some intensive practice I can make something out of this. My concern is whether this could possibly be a delusion based on faulty assesment. Though i’m also not sure if that’s true because I have been spending a lot of time away from work so that I can think of where my actions are taking me. And by no means feel as if skateboarding is an escape from other cognitive functions. Any help would be appreciated, thankyou! I loved this episode, thank you so much for the insight and advice, guys! I enjoy your podcasts very much. Hi. Thanks a lot for the podcast. Helped clear things out for me. I’m an INTJ. The Ni-Fi loop’s always been horrible, and so far, every time my Fi gets out of control, it’s taken me quite a while to recognize that it’s not natural – that something is wrong with the way I’m thinking/feeling. By the time I realize that the loop’s in full swing, I’m exhausted from all the effects of an unhealthy, overactive Fi. Somehow I often forget I have a Te to help with the situation. When I do employ Te finally [mostly by accident] and step out of the loop, it’s with huge relief and my head feels like a storm just cleared. Everything starts making more sense. But by then, I’ve wasted a lot of time acting really immature. Probably caused a lot of damage too. The key is stepping out of the loop early. I find it hard to recognize the loop when I’m in one. I suppose the solution would be to develop my Te and use it more, so I reduce the risk of being drawn into the loop at all. Face every problem squarely, and remember to do what I do best – analyze and make a plan, before it all gets out of hand. And the good part of Fi has always helped me sympathize and communicate, although I realize I don’t use it as much as I should. But it’s rewarding every time I do use it sensibly. How does this work with an ISTJ? (Since authenticity is my 10 year old). I listened to the podcast and really enjoyed it…but am still having a hard time with understanding authenticity as my ten year old. I naturally have a hard time with vulnerability and intimacy…so how is authenticity my defensive state? Any clarification would be greatly helpful! Thank you! Interesting podcast. Now very curious to know the benefits and ways to develop the 4th function, the 3-year-old. This was the first episode I’ve ever listened to. And I have never heard of anything close to the car model or the primary, secondary, tertiary .. parts of the MBTI model. I am fascinated. For the last few days, I haven’t been able to stop thinking about this. As an ENTP my self, I get hit with self-confidence (particularly wanting to fit in) and fear (particularly taking risks) – this makes sense because my 10-year is Fe (harmony). When I am not at my best I don’t want to mess up. It seems like my co-pilot Ti has been a strong suit in helping me journal and introspect the mind blocks that my emotions play on me. I’m able to rationalize the fear. Also my co-pilot helps me prepare my way out of the fear. Out of all this came my podcast topic Courageous Self-Confidence where I’m the one who seems to be struggling through it. In times of play (as mentioned in the show). I tend to be pretty competitive when it comes to games. HOWEVER when I allow myself to “play” and have fun, my 10 year Fe (harmony) can kick in and I take the attitude of “winning is an attitude not a score” and “just as long as we are all having fun, it doesn’t matter if I win or lose”. Really great podcast! Thanks so much for touching on this topic. 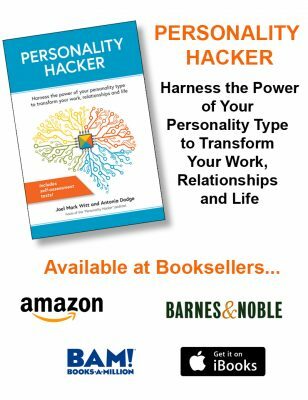 I found it particularly helpful because my husband is an INTJ, and my mom is an ESFJ, so it is great to have more insight into their processes. 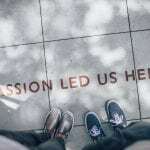 As an INFP I do sometimes struggle with a temptation to shut myself off–particularly if I have been spending a lot of time around people and/or encountering situations that I find stressful. Thankfully my life circumstances have powerfully reinforced my exploration co-pilot for decades, and I have employed memory pretty well in “creating safe environments for people I love.” I think I need to understand a bit more about how to use memory to support exploration when I feel myself pulled toward the introversion loop, though. But, according to the rule of thumb you mention, I am also ready to start working on my “3 year old,” haha! Oh, hey, you know what would be super helpful? Could you post the podcast-specific exercise at the end of the podcast notes? Really appreciate what you do!!! ISFP here. Memory (Si) driver and Harmony (Fe) copilot combine to make me (when healthy) concerned about others. In just the last few months, I have noticed that my Accuracy (Ti) 10 year old process has been maturing. In my final semester of college (I am a nontraditional student), about 50 of us had to present our Capstone projects. This was scheduled for 9 am to 2:30 pm, and no lunch was provided. So I arranged for finger foods to be catered, collected donations from my classmates to cover the cost, and kept an eye on it (during my presentation time, how fun!). Everything worked out very well, and I was given an award by my department partially because I stepped up to make sure that everyone was cared for. I do, however, have to watch out for Accuracy, because if I feel defensive, I have a tendency to turn off the Harmony and just be really mean, cold, and harsh. All the facts, none of the concern about others’ feelings or situations. Hi Cathy! Thanks for the comment. I’m the same way. As an INFJ I have the same copilot and 10 year as you do. It is a constant battle to stay in Harmony when Accuracy wants to take over.